Tommy Pham his two home runs in the series finale against the White Sox, on Wednesday. Looking to win their fifth consecutive series of the young season, the Tampa Bay Rays will cap their nine-game road trip north of the border, when they start a three-game series against the Toronto Blue Jays on Friday. The Rays are coming off a three-game sweep of the White Sox, while the Blue Jays are coming off a series split against the woeful Red Sox. Tampa Bay got a much deserved day off after the team ripped White Sox hurlers for 24 runs and 38 hits over the life of the series, improving to 5-1 on their nine-game road trip. Besides a dominant pitching staff that has performed to an overall 1.98 ERA/2.66 FIP, another key to the Rays’ fast start has been their ability to plate early runs. Tampa Bay is hitting .367 with five homers and 17 runs scored in the first inning of their 13 games. Meanwhile, the Blue Jays are a team that has been blessed with a good pitching staff, yet a sputtering offense. Even though they averaged 6.5 runs per game (RPG) against the reigning World Series champs, that run production is clearly the exception, not the rule, as the Blue Jays have averaged just 3 RPG over their first 14 contests. Just two hitters have been consistently productive in Toronto’s lineup: Freddy Galvis, who is hitting .333 BA/.381 OBP/.641 SLG/1.022 OPS with three home runs (at the time of writing), and Richard Urena, who is hitting .350 BA/.381 OBP/.500 SLG/.881 OPS across 20 at-bats. Otherwise, the Justin Smoak’s and Lourdes Gurriel’s of the lineup have been quiet. In 2018, the Rays dominated the Blue Jays, winning 13-of-19 games, and posting a +31 run differential. This will be the first meeting of the two teams since longtime coach, Charlie Montoya, took the over reigns as the manager of the Toronto ballclub. Over the next three days Kevin Cash is expected to lean on Ryne Stanek (0-0, 1.50 ERA) — who will likely be followed by Yonny Chirinos (2-0, 0.75 ERA) in the opener — Blake Snell (2-1, 2.84 ERA), and Charlie Morton (2-0, 2.25). Montoyo will respond with Trent Thornton (0-0, 1.69), Clay Buchholz (2018, 7-2, 2.01 ERA), and Marcus Stroman (0-2, 2.41 ERA). Ryne Stanek has opening duties for the Rays for the third time this season. The right-hander was touched for a run in Tuesday’s 10-5 win against Chicago in relief, yet has tossed three shutout innings in his previous two games as an opener. Yonny Chirinos isn’t scheduled to start at any point this week and will instead work in relief on a temporary basis. In two outings as a starter, Chirinos has been dominant, performing to a 0.75 ERA/2.60 FIP across 12 total innings of work. It would be a reasonable guess for him to take the mound after Stanek on Friday. Trent Thornton has pitched well in his first two starts of the season although has nothing to show for it. The right-hander has been backed with just two runs of support in his two starts even though he has held opponents to a .139 batting average while striking out 15 in across 10-2/3 innings of work. Thornton allowed two runs on three hits over 5-2/3 innings while striking out seven in Cleveland last Friday. He did have some control issues compared to his season debut, walking two hitters while throwing 92 pitches. He also has been very lucky, pitching to a .200 BABIP, so regression is expected. The Rays are hoping the luck dragons will nip in their favor on Friday. 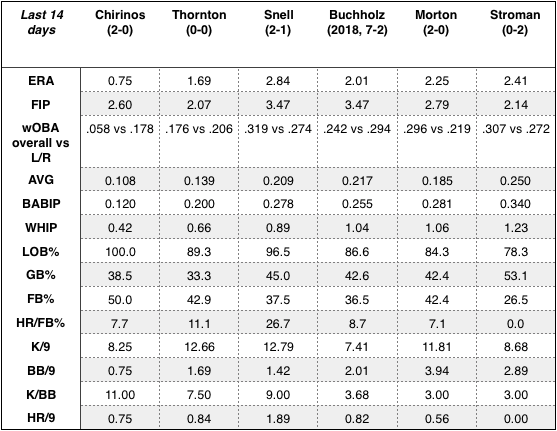 Thornton relies primarily on a 94 mph four-seam fastball, while also mixing in a hard 81 mph curveball with a ton of spin, an 89 mph cutter with natural sink and strong cutting action, and a whiffy 83 mph splitter with a lot of backspin on it. I’ve evolved into a different kind of pitcher. I’ve proven you don’t have to throw 98 to get guys out. You have to throw four pitches for strikes, mix it up, and keep guys off balance. That’s what I do. 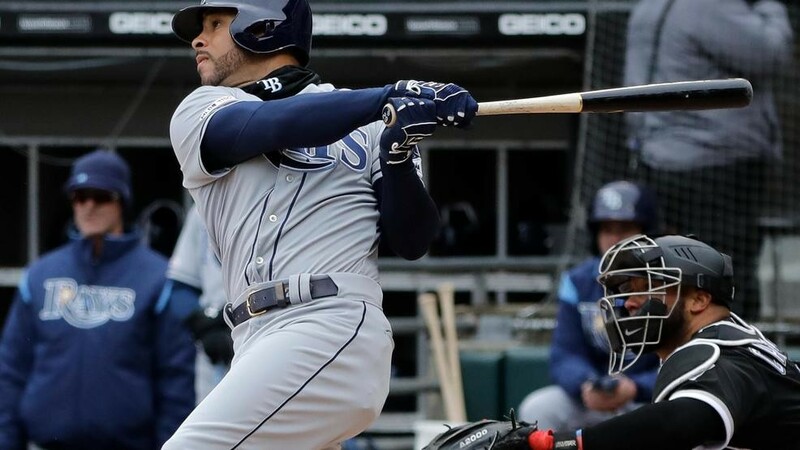 The Tampa Bay Rays look to cap what has been a successful road trip with a few more wins when they start a three-game series against the Toronto Blue Jays on Monday night. Tampa Bay prevailed against Cleveland on Sunday, 6-4, taking two of three from the top team in the AL Central. Toronto took two of three on the road from the Marlins in Miami, winning the rubber game 6-1 Sunday afternoon. The Rays took two of three in the last series against the Jays, which was in Toronto from August 10-12, and are 7-2 this season overall. With the win Sunday, the Rays improved to 73-63, moving 10 games over .500 for the first time since June 2015 — Kevin Cash’s first season — and this late in a season since 2013, the last time they made the playoffs. They have also stayed within sight of the final Wildcard spot, starting the series with Toronto eight games back of the Athletics, who they will face September 14-16 at Tropicana Field. It’s one of those things where everybody in this clubhouse feels like we have a chance to be in the race and that we’re not out of it yet. So, we’re definitely going for it. And we’re having a lot of fun doing it, Ryan Yarbrough said after the series finale on Sunday. This should make for a compelling week of baseball as Oakland plays host to the Yankees, who then will face the Mariners, who are also in the Rays’ way. Dare I say let’s go Yankees? The Blue Jays aren’t an awful team offensively speaking, although the pitching staff leaves a lot to be desired — ranking 12 out of 15 in the American League, and 27 out of 30 overall. Toronto’s hurlers have actually been worse in the month of August, combining for a 5.64 ERA/4.94 FIP/.287 BAA line. Meanwhile, the Rays offense has not hit a lot of homers, although CJ Cron and company have been mightily productive, with the team averaging 4.5 runs per game over the last 14 days. 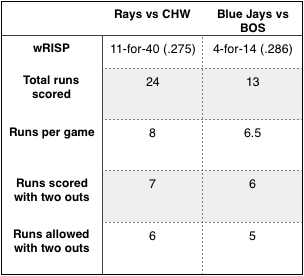 As they have done all season, it will be incumbent upon the Rays to limit the long-ball, Toronto’s main facet of run production. Also, expect Tampa Bay to put the ball in play, then run all over Russell Martin and Luke Maile. With the exception of Tyler Glasnow (1-4, 3.95 ERA), who is slated to pitch in the finale on Wednesday, Kevin Cash has not set the openers/starters for the first and second games of the series. Even so, Ryne Stanek (2-3, 2.77 ERA) will likely open the game on Monday, while Yonny Chirinos (2-5, 4.05 ERA) should see the most mound time. Jalen Beeks (4-1, 6.08 ERA) will, presumably, pitch the bulk of the innings on Tuesday. John Gibbons will counter with Marcus Stroman (4-8, 5.27 ERA), Sam Gaviglio (2-7, 5.16), and Ryan Borucki (3-3, 4.52 ERA). Ryne Stanek worked around a hit with one strikeout in a scoreless inning of work Tuesday as the opener in Atlanta. The right-hander threw seven of 11 pitches for strikes as he faced the minimum three batters in his inning of work, thanks to a caught stealing of Ender Inciarte. Yonny Chirinos was hit hard following Stanek, tossing five innings and allowing five runs (two earned) on seven hits and three walks. He struck out three in the 81-pitch outing (51 strikes, 63% strike rate, 17/25 first-pitch strikes). Chirinos wasn’t particularly sharp and was on track to take the loss after departing with the Rays trailing 5-4, but Tampa Bay ended up tying the game in the eighth inning to take the right-hander off the hook. Jalen Beeks got the win Wednesday, pitching three shutout — and rain-shortened — innings with two strikeouts while allowing four hits and three walks against Atlanta. An hour and six-minute rain delay limited his outing to just three innings and 49 pitches (26 strikes, 53% strike rate, 9/15 first-pitch strikes) — both of which were season-low totals since joining Tampa Bay — although it was still enough to pick up the win for a third straight outing. The rookie southpaw has a 2.63 ERA with a 2/1 K/BB in 27-1/3 innings since the start of August. Tyler Glasnow was excellent on Friday, throwing seven innings of one-run ball while allowing two hits (including a homer) and one walk on an efficient 76 pitches (56 strikes, 74% strike rate, 19/24 first-pitch strikes). He struck out six. Glasnow pounded the top of the zone with his upper 90’s four-seam fastball before working over the edges of the plate. Then, he would drop in a low-80s curveball, with 7-to-8 inches of depth, over the heart of the plate, resulting in a good number of taken strikes. On occasion he would drop in a mid-80s slider, that fell right off the table and onto home plate, resulting in a 16.7% SwStr rate. The depth he got on his offspeed stuff was unreal, thanks in part to his release point which mimicked that of his four-seamer. Ryan Borucki coughed up five runs on eight hits across 4-2/3 innings while striking out two. The rookie was staked to an early four-run lead, yet Baltimore quickly stormed back while an Adam Jones grand slam in the fifth inning helped chase Borucki from the game. He has relied primarily on a heavy sinking 92 mph four-seam fastball and a firm 84 mph changeup with a ton of backspin, while also mixing in a 79 mph slider with exceptional depth and short glove-side cutting movement. — Mallex Smith, who was seen in uniform in the background of a Willy Adames Instagram story yesterday, should be reinstated from the 10-day DL on Monday. — The Rays made a surprise roster move on Sunday, promoting INF/OF Andrew Velazquez from Triple-A Durham to provide depth at several positions. The move was made in part because CF Kevin Kiermaier remains sidelined due to a sore back and Velazquez can play centerfield. To make room on the 40-man roster for Velasquez, the Rays put injured RHP Jose Mujica on the big-league roster and then on the 60-day DL. Meadows hasn’t played since Wednesday when he was hit on the left hand in the at-bat after his third homer of the game. And why Velazquez over Kean Wong, who also plays infield and outfield and is having a great year? 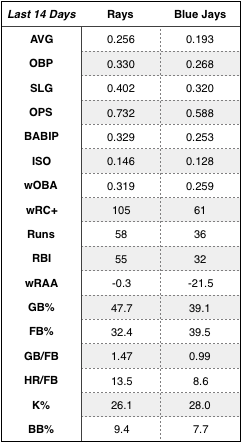 Because Velazquez is better and has more experience in center, can play short which Wong doesn’t, is a faster runner which makes him a potential pinch-runner, and is a switch-hitter while Wong is a lefty, of which the Rays have plenty. The Tampa Bay Rays and Toronto Blue Jays are set to start a three-game series on Friday night, at the Rogers Centre. Tampa Bay is coming off a series win against the Baltimore Orioles, while Toronto dropped two-of-three to the Red Sox, thanks to some atrocious pitching. An anomalous appearance by Sergio Romo in the second game of the series against Baltimore — resulting in a loss — notwithstanding, the Rays did what they set out to do: win the series. Jake Bauers came up big, driving in six of Tampa Bay’s 13 runs including four in the series finale. Mallex Smith also did his part, going 3-11 with five runs over the last three games. Toronto, on the other hand, had nothing to show for its efforts against Boston, dropping two-of-three. After three straight games where they were very impressive against Seattle, the Jays’ streaky pitching staff struggled once again — allowing just six total runs in the first three games against the Mariners, but a whopping 31 runs in the four that followed. The bullpen has been the largest contributor to their poor spate of play, with the relievers carrying an 11.40 ERA over the last five games. As always, the Blue Jays represent a powerful team that can hit the ball long distances. That being said, Toronto also strikes out at a decent clip and doesn’t walk a ton. The Rays pitching staff must keep the Jays in the ballpark, while Bauers and company need to jump on any mistakes they may see at the plate. Over the next three days Kevin Cash will lean on Blake Snell (12-5, 2.27 ERA), Jake Faria (4-3, 5.26 ERA), and Tyler Glasnow (0-0, 2.57 ERA). John Gibbons will counter with Marco Estrada (5-8, 4.65 ERA), Sam Gaviglio (1-4, 5.25 ERA), and Marcus Stroman (4-8, 5.20 ERA). Blake Snell allowed one run on three hits and two walks over four innings while striking out three against the ChiSox, in his first start since recovering from shoulder fatigue. Snell was limited to 59 pitches (34 strikes, 54% strike rate) but delivered a solid effort, with the only run against him coming via a Jose Abreu homer. The southpaw will likely get stretched out a little further in his next outing Friday. Jake Faria was credited with the win in Wednesday’s 7-2 victory over the Angels, allowing one run on four hits and three walks over 3-2/3 innings of relief. He struck out four on 68 pitches (41 strikes, 60% strike rate). Faria entered the game in relief of Tyler Glasnow, though he wasn’t exactly sharp. Even so, he limited the damage from his lack of control and benefited from a couple of big innings by the Rays offense. Tyler Glasnow made his second start for the Rays on Monday, but because he had been used as a reliever in Pittsburgh, Glasnow was on a pitch count of four innings or 60 pitches and will continue to be until he is fully stretched out. Over his first two frames, Glasnow struck out five of six batters on 98 mph fastballs and low 80’s curveballs that were hard to time up due to the speed differential and the movement. Baltimore got its first baserunner with two outs in the third, when Caleb Joseph singled and swiped second, but Glasnow struck out Jonathan Villar on four pitches, setting up a filthy 86 mph slider with a trio of fastballs. Tim Beckham, ever the intrepid fastball hunter, led off the fourth inning with a solo home run when Glasnow’s velocity dropped a touch, but that was the only damage incurred against the tall right-hander. All told, Glasnow struck out nine and walked none — not bad for a guy with a reputation of having control issues. Following the game, Glasnow told reporters he feels comfortable with Tampa Bay and is pitching more athletically than trying to control his delivery. I felt good physically and I wanted to go out and attack, Glasnow was quoted as saying. The next step for Glasnow is to prove he’s capable of going five or six innings per outing. — Key number: six, as in the Rays have played six consecutive one-run ballgames. They’ve gone 2-4 over that stretch. #PlayersWeekend is back! You gotta check out these names. The Tampa Bay Rays and Toronto Blue Jays will begin a three-game series at Tropicana Field on Monday night. Toronto is coming off a four-game sweep of the Baltimore Orioles, while the Rays dropped three of four against Seattle, and nine of their last 10. The Blue Jays have been scorching at the plate of late, racking up 27 runs and 56 hits en route to a four-game sweep of Baltimore. For their part, the Rays are not a bad team, however, they are just shy of being a good team … more often than not one run shy. Tampa Bay has lost a Major League leading 17 games by one run, including three in their last series. With yesterday’s loss, the Rays have fallen to 29-35 on the season and run fourth place in the AL East — 1/2 game behind the Blue Jays. Kevin Cash will lean on Ryan Yarbrough (4-2, 3.68 ERA) in the series openers, and presumably Austin Pruitt (1-3, 4.57 ERA) and Matt Andriese (1-3, 3.58 ERA) on Tuesday and Wednesday, based on when they last pitched. The Rays, however, have not set the starting rotation. We will offer updates when the situation clarifies. John Gibbons will counter with Sam Gaviglio (2-1, 2.51 ERA), Jaime García (2-4, 5.57 ERA), and JA Happ (8-3, 3.71 ERA). Ryan Yarbrough will get the start on Monday. He has made 14 appearances this season, and has pitched to a 3.68 ERA/3.91 FIP over 58-2/3 innings overall. And though he is averaging just over four innings each time he gets the ball, that’s due in large part to his usage from March 31 to April 28. In his last outing, Yarbrough allowed five runs (four earned) on 10 hits and two walks over 5-1/3 innings. Austin Pruitt (1-3) allowed five earned runs on seven hits and one walk while striking out six across seven innings on Thursday. To be sure, the five earned runs are ugly, however, the bulk of the damage came in a three run second, and the other runs came on a pair of solo homers to Denard Span and Mitch Haniger. That is to say, Pruitt settled in and kept the Rays in the game. Pruitt has allowed four or more runs just three of his 10 appearances this season. Matt Andriese allowed two earned runs on five hits, a walk and an HBP over 2-1/3 innings of a loss to Seattle on Friday. He struck out two. Andriese stayed away from the long ball, although he struggled overall through 48 pitches. The two runs he allowed came on soft contact — a Guillermo Heredia fielder’s choice and a Mitch Haniger single — but, the fact remains that Andriese has already allowed three earned runs over his first two June outings, and multiple runs in four of his last five appearances. All this after he performed to a .169 BA/.217 OBP/.338 SLG/.555 OPS line, and a 2.04 ERA/3.33 FIP, over 17-2/3 innings in May. — Kevin Kiermaier and Adeiny Hechavarria are set to begin their rehab assignments this week, with both players heading to Port Charlotte Monday and Tuesday. — Daniel Robertson left yesterday’s game in the first inning with a strained hamstring. While not severe, the injury was enough to place Robertson on the 10-day disabled list. In his place, the team has promoted one of baseball’s top prospects, Willy Adames, back to the big leagues.